Two wild and woolly Christmas stories by legendary Western author James Reasoner. It's a life or death Christmas Eve for the man accused of murdering the son of the richest man in the territory. Former shotgun guard Judge Earl Stark knows how to stomp his own snakes, and he makes sure 'TIS THE SEASON FOR JUSTICE. Texas Ranger Cobb is supposed to pick up a prisoner wanted in Parker County and take him back down to Weatherford. 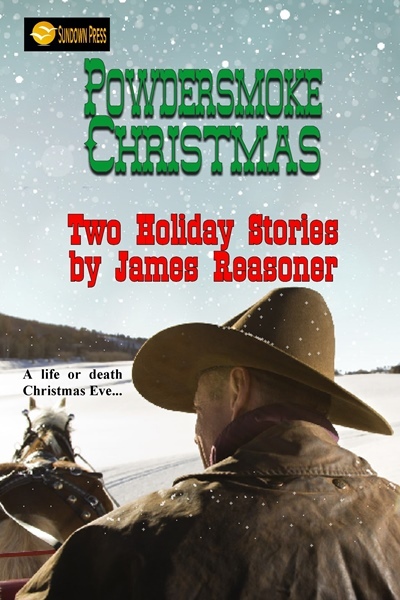 Instead he finds himself battling a gang of outlaws and tangling with an old coot driving a wagon full of Christmas gifts, and it's up to him to make sure there are PRESENTS FOR ONE AND ALL. He heeled his horse into motion again, urging the weary animal into a reluctant trot as he veered left to intercept the wagon's route. The snow was a couple of inches deep on the ground by now, and it helped to muffle the horse's hoofbeats. The wagon's driver heard the rider coming, though, and hauled back on the reins. The team came to a stop. Cobb was about twenty yards away when the driver swung up a rifle and pulled the trigger. A startled curse exploded from Cobb's mouth when he heard the whipcrack of the shot and saw flame spurt from the rifle's muzzle. As he brought the horse to a skidding halt, his right hand reached toward the revolver holstered on his hip, under the jacket. He stopped the move when he saw the driver lower the rifle and aim at him. "I put that first one well over your head, mister!" the man yelled. "If you try to pull a gun, I'll put the next one right through your gizzard!"